Before I get into the new stuff, I have BIG plans for this weekend - BIG PLANS. 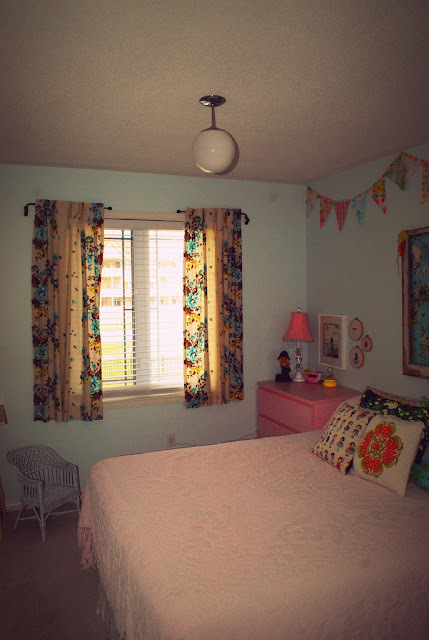 I am going to FINALLY repaint our bedroom. It is going to be such a welcome change. Right now, everything in the room is brown, from the walls to all the furniture. I can't stand it anymore. The plan is to paint the wall behind the bed black and the other 3 walls white. I'm so excited. And I actually enjoy painting. I'll take some before shots of the hideous room too to post. I'm finally repainting because we got some good news recently (finally) - Pablo's application for long-term disability was accepted!!! It's been a struggle trying to support the family on my income alone. Pablo is very excited at the thought of being a stay at home dad - and providing an income at the same time. This way he can concentrate on recovering from his brain tumour (and hernia, etc.) without having to worry about finding work. Repainting is a little present to celebrate the good news. Next purchase was lighting. We bought our house new four years ago and the light fixtures that came with the house for the most part are terrible - the cheapest fixtures that Home Depot sells. I've been dying to replace them but haven't been able to. Then I had an idea the other day. 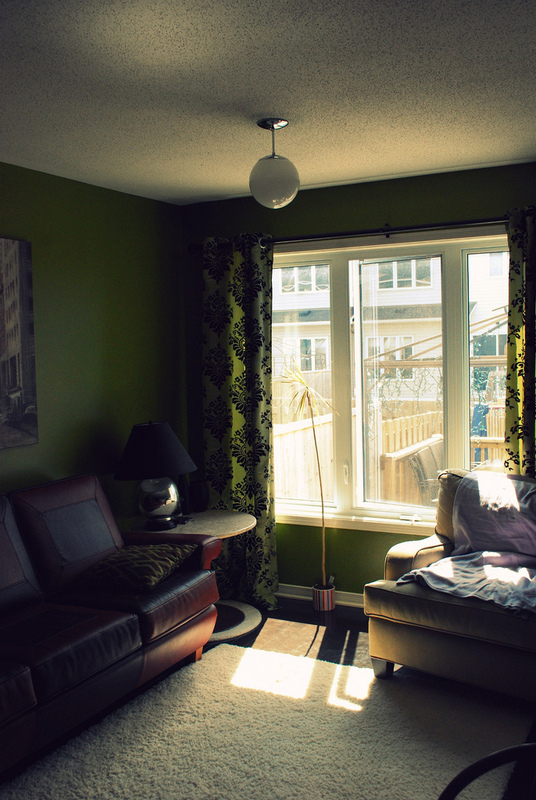 The main floor of our house is open concept and the living room and dining room is one big room. The builder meant for the dining room to be in front of the big window but we decided to be different and swap the living room and dining room. 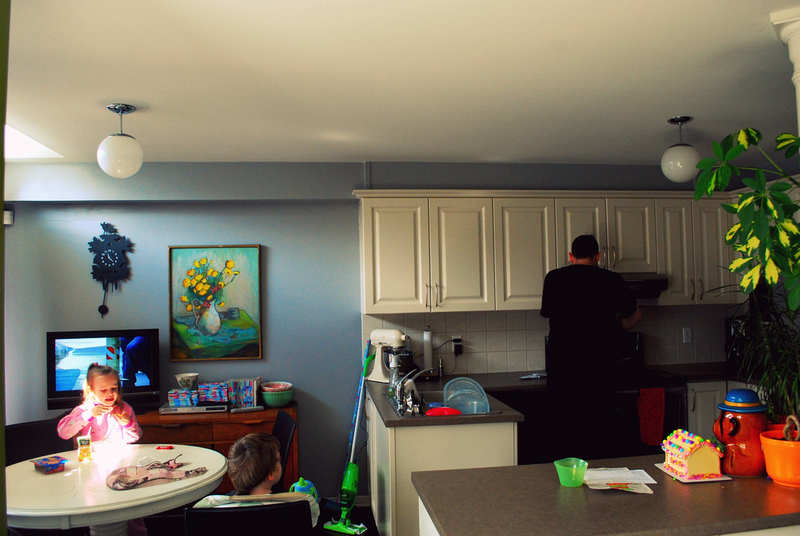 Our living room is across from the kitchen and in front of the window. Since it is where the dining room was supposed to be, there was a socket in the ceiling for a chandelier but we never put one in. Until yesterday. We have a serious lack of proper lighting on the main floor so for $14.99, we bought the same fixture, which I happen to love, that was installed in our kitchen when we bought it. And for $14.99, you can't go wrong. Perfect temporary solution. 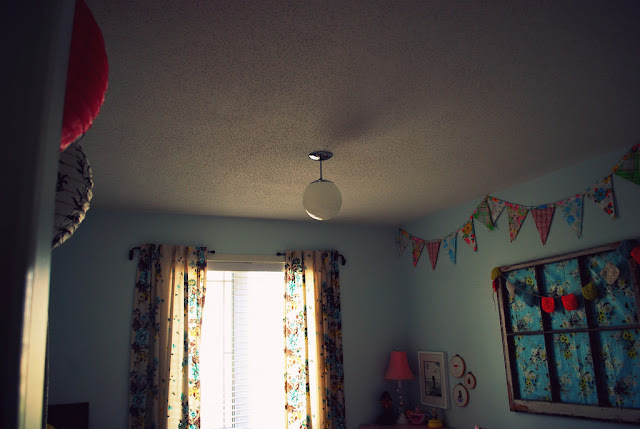 I liked that light so much that I also bought one for Isabella's room. 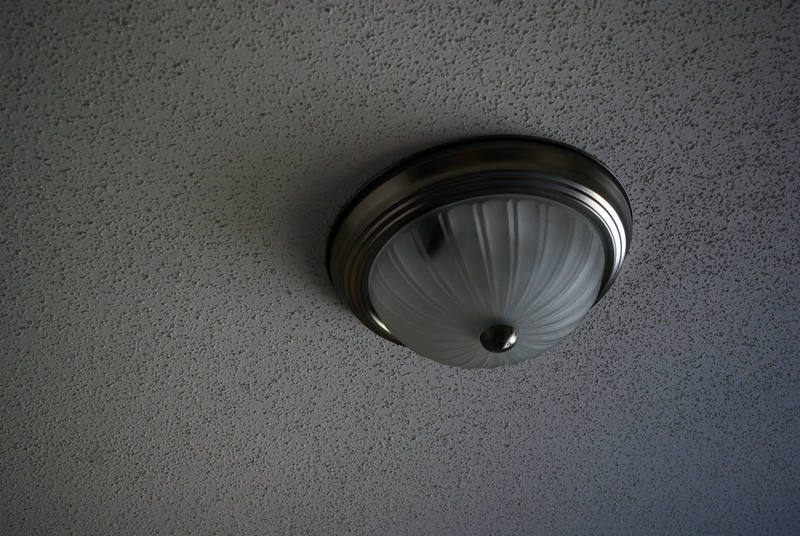 The builder had installed these super ugly ceiling lights in the kids' rooms, the stairwell upstairs and in the basement. I eventually need to replace them all because they are terrible so 1 down and 5 more to go. *** Side note not related to this post at all - we took Simon for his hip xrays yesterday. We got an appointment for Simon to see a specialist IN OCTOBER. Good to know that an 'extreme' case of out-toeing (googled and found that term) gets you an appointment 6 MONTHS LATER. Pablo called the specialist to complain and they said that if the xrays come back with a serious issue that needs attention right away, they won't make us wait till October. Xrays will be sent out on Monday. We will patiently wait and painting is just the thing to take my mind off it. congrats on pablo's application being approved. that must be a huge relief. good luck with the painting also - i too have the redecorating bug - and we wait to do the bits that we can afford.....slow and steady!! Greatnews for Pablo, a big relief I'm sure. I think I know why they stopped selling the chairs, my sis-in-law had one and the back broke off. I think though she used it pretty hard. That's excellent news about Pablo's disability application! And I can't wait to see the photos of the painting. Iona - HUGE relief. 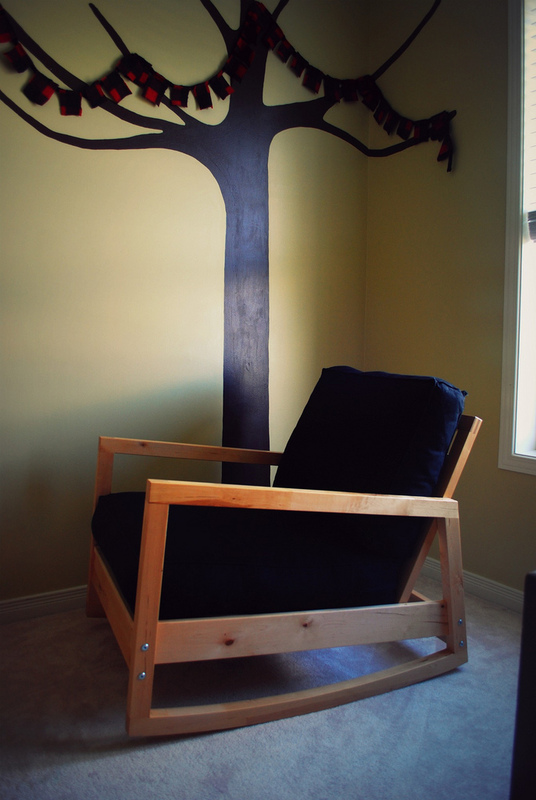 Good to know about the back of the rocker - I'll have to make sure the kids are careful. Congrats abt the good news - that's fab. I've always wanted one of those rockers! Thanks! 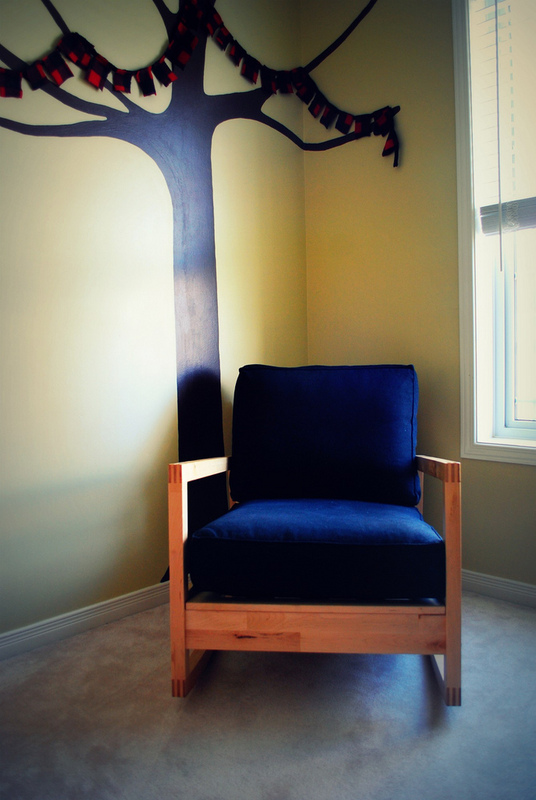 The rocker is fantastic - the kids love it because it's nice and big and they both can fit on it together. Sorry to hear about the 6 month wait! We had a similar problem here (Saskatchewan) with the geneticist. My daughter was thought to have Larsen's syndrome and needed to be tested and the wait list was a year to 18 months. I took a chance and called the office to see if they had a cancellation list. They did and although it was short notice when it happened- she got in three months later. (and no Larsen's syndrome thankfully). So that might be something you could try with your specialist. Good luck! That's great jenn that your daughter didn't have Larsen's syndrome! The wait times to see specialists is just horrible. Not only do we have a wait for Simon's hip problem but we have a 12 month wait to get him in for a speech assessment through the children's hospital (CHEO). Very frustrating. The hip specialist did say that if the xrays show something serious, Simon most likely won't have to wait the 6 months.